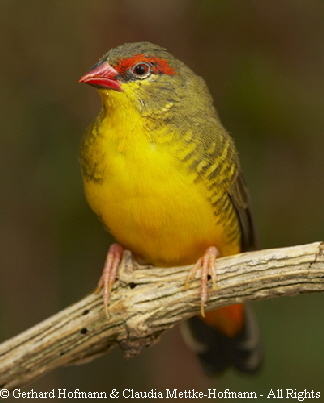 With a body mass of five to eight gram Gold-breasted Waxbills are among the smallest Estrildian finches. 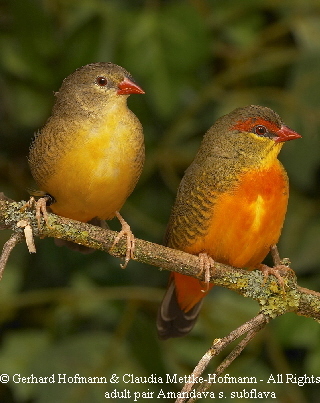 Despite looking like colourful tiny fragile things they are among the hardiest and easiest to breed African finches. No wonder that they are so popular and on the wish list of many finch lovers. border areas which look somehow intermediate which makes identification of the subspecies sometimes impossible. The species likes wetlands and areas covered with high grass and reed. Often it can be found along rivers or in flooded areas. But the species is in no way restricted to these wet areas but can also be spotted in the grassland of higher plains as well as along forest edges or around human settlement. 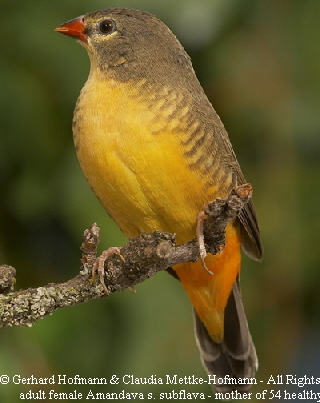 Surprisingly they can be found from the lowlands up to 2400m elevation as it is the case in Ethiopia. These little birds show an enormous flexibility in terms of habitat choice - a behaviour which makes it a lot easier for us to offer a suitable habitat in our aviaries. In the wild Gold-breasted waxbills feed mainly on small grass seed which may be either full ripe or preferably still green. COLAHAN (1982) lists the following plants as food for the species Setaria sphacelata, Rhynchelytrum repens, Digitaria milanjiana, Panicum novenmere and Hyparrhenia cymbaria.S. 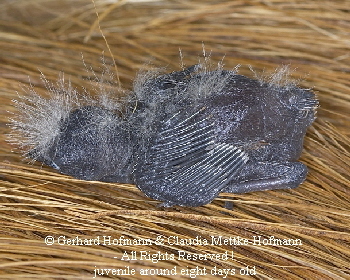 shacelata, P. novenmere and H. cymbaria were also found in the crop of nestlings. The northern population seems to build their own nests as it is usual among Estrildian finches. The southern population, however, only rarely seems to build their own nest but takes over abandoned nest. They only restore them a little and line the nest chamber with preferably white feathers. Goldbreasts got to Europe quite early and were also among the bird species which were readily available as import-birds all the time. As with many of these formerly common and cheap birds they create a lot of interest now that they got rare and are no longer cheap. But unlike too many other species there is big chance that we will manage to keep this species in our aviaries even if no new wild caught birds will be available any longer. These lovely birds are among the hardiest and longest-living finches coming to my mind. A life span of six to seven years is fairly common but also realy old birds such as 10-11 years old are more common in Zebra-Waxbills than in any other Waxbill I know. Additionally some pairs are extremely good breeding pairs. One of our pairs raised 54 juveniles over a period of six years. They were imported wild caught birds which were in full adult plumage when we got them. Despite their small size the birds should not be kept in small cages. They are too active for tiny enclosures. Our smallest cages are 1.2 x 0.6 x 0.6 meter. One corner of the cage offers cover and protection in form of reeds and some scrub fixed to the wall of the cage. These structures help a lot to speed up the process of settling down in a new environment. Very important is a small enough wire-mash. Common mesh-sizes are often suitable to keep the adults birds where they belong – inside the aviary or cage - but newly fledged babies are so small that they find their way out. Our mash is about 9 x 9 mm and so far none of the birds escaped. But we had an adult female finding its way out of the show-cage because the opening for the water dispenser was too big and when the helpers removed the water-dispenser the bird got out. Luckily its mate was in another cage and she came back to her mate after one hour and could be caught. For me one of the big pleasures keeping finches is to observe Zebra-Waxbill in well structured large cages but the climax for both the birds and the breeder is a well planted aviary. The birds use the whole aviary, hide and seek shelter in the dense vegetation or forage on the ground. Like their relatives Zebra Waxbills mainly feed on the ground and are well adapted to this. Probably only the related Quail and Locust finches spend more time on the ground than Zebra Waxbills. As Zebra-waxbills can cope pretty well with the temperatures occurring in Southern Germany we kept most of our birds in outdoor aviaries during May to the end of September. Often they were housed together with a variety of other waxbills and mostly all of them got along quite well just the close range of the breeding nest is defended heavily and it even doesn’t matter when the intruder is twice the size of the defender - it will get chased away. 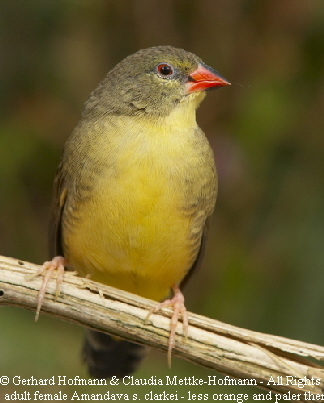 We never had much success keeping more than a pair of breeding Zebra Waxbills in the aviary. The birds disturbed each other way too much so that we skipped this experiment and housed single pairs together with other Waxbills. We also would not recommend keeping them together with their closest relatives Strawberry Finches or Green Avadavats - we got hybrids in both cases. 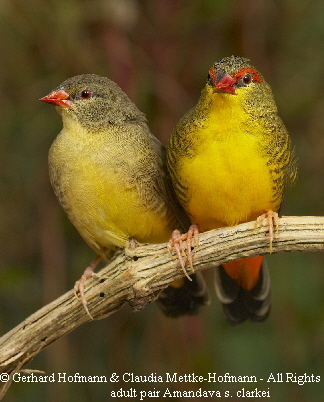 During the non-breeding period Zebra Waxbills can be housed in a flock without any problems. Feather plucking is usually not a problem when the aviary provides some vegetation to explore and some structure to hide – the more birds are in the aviary the more important does this environmental enrichment get. The birds never get that tame as for instance Lavender Waxbills but tend to keep a distance even to the people they see every day providing food and all the other goodies. But they nearly never panic like some Parrot-finches or Bluebills. Luckily nutrition is not a big deal with this species; I even would go so far to say that among Waxbills they are probably the one easiest to feed. They are not picky and choosy like some other species. Of course as one of the tiniest finches they should not be offered large seeds but small ones. We feed a mixture for waxbills from Blattner as well as another mixture containing 30% Mohair-millet, 40% annual Meadow grass and 30% Orchard grass. The tiny seeds help to keep them busy and in a healthy body condition. When they are forced to feed on big seeds they often get health problems. Because most of our Goldbreasts just love the green tipps of sprouting grass we sow some grass in small pots with peat. As soon as one can see the first green tips we put them in the cages. Nearly all birds go for it immediately. For raising their offspring our birds use a considerable amount of live food. Their favourite as with most our birds are fresh and second frozen ant pupas. As one never has enough of this deli food for Waxbills we are quite happy that our birds also accept lots of other insects like small white mealworms or frosted Buffalos and Pinkies. Like most species feeding and searching the food on the ground Gold-breasted waxbills accept new food better if it is offered on the ground and not in a food bowl. Therefore we have print developing trays - normally used in a photo-lab - where we offer a mixture of bird soil (or not fertilized peat), germinated seeds, frosted and living insects as well as some egg food. Of course, one has to change the whole mixture every day and has to wash the tray before filling it up with a new soil/food mixture. This method of offering the food is usually well accepted by all Waxbills. They have at least to work a bit to get their food and with this method we had fewer numbers of pairs deserting their offspring after five to seven days and starting a new brood. It is also very easy to mix in some new food items which the birds would not accept right away if offered separately in a normal food bowl. As all Waxbills Zebra Waxbills love Half-ripe Millet spray and all kinds of seeding wild meadow grass and chickweed and never can get enough of it. One has to be careful not to offer too much of the millet as some birds will take only this and nothing else. Grass-seeds and green food can be offered in large quantities without problems. portions once a week during the non-breeding season, whereas they get it daily during the breeding season. This seasonal feeding concept does not only help to keep the birds in good shape but also helps synchronize the birds for the next breeding season. Sand, cuttle bone, and crushed oyster shell should be available daily, as should crushed baked poultry eggshells and mineralized grit. To prevent egg binding, we start to dust the offered seeds with Nekton MSA one to two months before the breeding season. The species belongs to the few Waxbill-species which breed and raise their offspring quite easy and reliable. Most of the pairs start breeding as soon as they have settled down in their new environment whether this is a cage or an aviary. Good breeding pairs will raise brood after brood and often after raising three broods they still would go on. In this case we remove all possible nesting sites, nesting material and if this doesn’t help we move the pair including their fledglings to another cage. Mandatory for good breeding results is the availability of suitable food and that the birds are used to it. The food should contain lots of half ripe/germinated seeds like grass seeds or sort of small millet seeds but most pairs also depend on live food like already mentioned before. Few of our birds would raise their babies only with germinated seeds and commercial egg food mixed with scrambled eggs. In all cases these where birds whose ancestors where born in our aviaries – we bred them for six generations - but even among these birds we found quite a few fledglings with white feathers (mostly primaries) which in nearly all known cases is a sign of malnutrition of the birds. Usually they will moult into a normal adult plumage but statistics show they often will never be as long living or robust than birds raised with insect food. Like with the food Zebra-Waxbills are not choosy about the right place to build their nest. 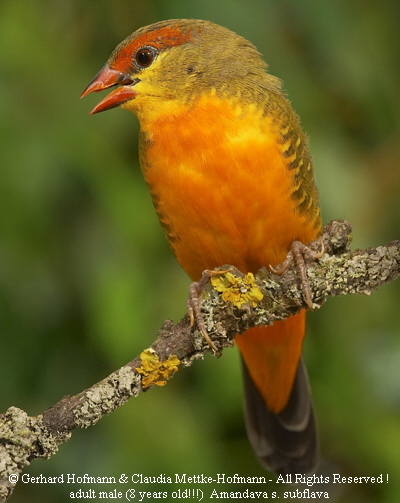 They build their nest in a dense scrub as well as in commercially available nest boxes. The southern subspecies – as in the wild - often likes deserted nests from other waxbills. 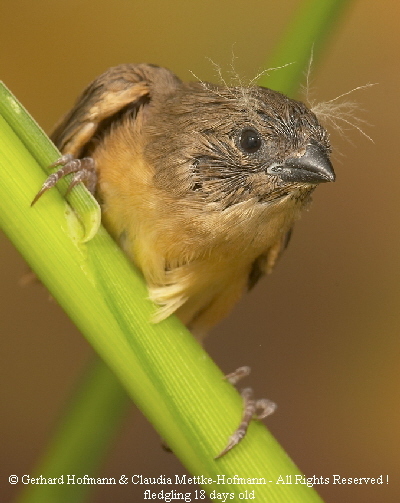 The bird talent for building a nest differs quite a bit from individual to individual. Some nests look like a piece of architectural art - very well build with a very solid construction - whereas others just look more like modern art even without a real roof and very sloppily done. These differences are often typical for species (Cut-throats for instance show the same differences) which start to loose their nest building behaviour and switch over to rely on readily available deserted nests from other birds. The birds will accept dry long grass or coconut-fibres as nesting material. For lining the nest chamber they prefer white feathers. The nest is usually built in two to seven days and the first egg is often laid before the birds are done with nest building. The clutch size doesn’t differ from other Waxbills four to six eggs is the average. Incubation last for 12-14 days. The nestlings are dark with yellowish white dunes. 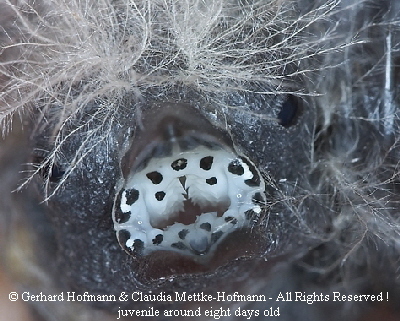 When the first of these little devils are spotted in the nest the parents will start to search for insects. Our birds are busy for hours digging in the dirt/ food mixture offered in the print developing trays. The first three days we often just add a couple of living tiny mealworms in the afternoon to be sure the bird find enough insects. A big advantage of offering the food mixed with bird-soil or peat is that a) the soaked or geminated seeds stay longer fresh and b) the birds have to search for their food and are kept busy. 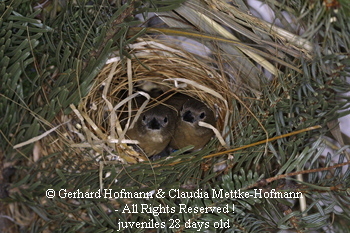 As already mentioned we had only very few cases where our Zebra-Waxbills failed to raise their offspring – in all cases the birds started (or better we allowed them to start) too early with their breeding effort and were not used to our food/holding conditions. We never had to split a pair because the couple didn’t get along well. It seems the birds are also not too picky in choosing their mates. If all goes well the babies will fledge around 17-19 days after hatching, often they will go back to the nest for roosting the next couple of days. Two weeks after fledging they are feeding on their own but if the aviary is big enough there is no need to separate them before they finish the moult into the adult plumage. With three months they are still a bit smaller than their parents but will be done with moulting. The situation is different if the breeding pair is housed in a cage, here the nosy and curious juveniles often will disturb their mother breeding on the next clutch. We rarely were able to house them together longer than necessary and now remove them one week after they are independent. Ohh and by the way this may be one of the smallest waxbills but nonetheless their voice is quite impressive. Not only the adult male with its Chiff-chaff like song but also the babies which can be easily heard begging when they are about four to five days old. Until they fledge the will create quite a bit noise but honestly is there a sweeter noise than of the healthy, loudly begging Zebra-Waxbills babies? I hope many finch lovers will have the pleasure to hear lots of this sweet noise in the future.